Being a huge fan of all things Abraham Lincoln, I was a little worried when I first picked up this book that it was just going to be horrible, and ruin my penchant for Abe forever. Boy was I wrong! Even persons vaguely familiar with Abraham Lincoln are likely aware of the love he had for his mother. Her passing was devastating to the young Abe, and although he loved his step-mother very deeply, no one could fill that void. That is where this journey begins. It begins with Abe finding out a vampire is responsible for his mother’s death. He discovers a vampire colony that is responsible for numerous unsolved deaths. And then he meets Henry Sturges. Vampire extraordinaire, Henry has the same goal as Abe. Henry teaches Abraham the ins-and-outs of vampires, and Abe is a willing student. What did the vampires have to do with the Civil War and the reshaping of our nation? More than you would ever believe. This story is told from the 3rd person perspective, with the journal entries of Abraham Lincoln dispersed throughout. We all know who won the war, and what became of Abe, so I will not spoil the story any more. 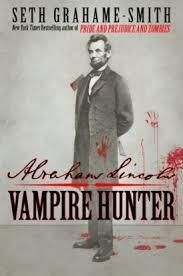 But if you like history, Abraham Lincoln, or vampires, you definitely need to read this book!